Editor’s note: One of the best things you can do for your children is sign them up for sailing lessons. 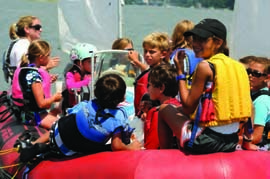 Daniela Clark, former Operations Manager at Longshore Sailing School in Westport, CT, a U.S. Coast Guard licensed Master and the co-owner of PhotoBoat.com, outlines the important life lessons that children learn while they’re having fun. There is simply nothing like being able to pilot your own craft at the age of 9 years old. Riding a bike is one thing. Skillfully steering and docking a sailboat is quite another. All of my athletic endeavors helped to shape my sense of self as a kid, but sailing was without a doubt the most instrumental. I have not only noticed this in myself; during my ten years as a sailing instructor, I have seen it again and again in my students. 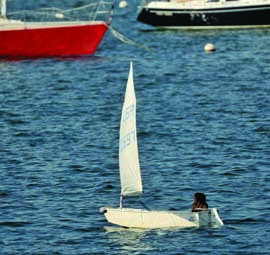 When kids learn how to navigate a boat through narrow spaces and tight turns – how to avoid collisions, coast to a dock with finesse, or squeeze into a packed starting line at a regatta – they develop a spatial awareness that will bring them prowess in all activities that involve coordination. Like driving, for instance. When I was 10 years old, I would sail all week with my class, and then go out on weekends by myself. I would pack a lunch and take my Optimist out for a couple of hours to explore. I believe that it was on those trips that I began to develop a good sense of direction. Noticing which direction I had come from, picking out landmarks, and knowing how to get back became a regular part of my stream of consciousness. That awareness is crucial to having a sense of direction. Do you know from which direction thunderstorms normally come? Do you know what the water temperature normally is on Long Island Sound in May? If your child is a sailor, he or she will know. Weather knowledge will come in handy both on the water and on land. Sailing students learn how to properly rig and unrig a boat. Kids learn to put things away in the right place, and keep them tidy while on the water. That’s a skill no mom or dad can argue with. Longshore Sailing School in Westport, CT even has a shipshape award for every class to encourage the behavior. So if your kids haven’t tried sailing, have them give it a try. Daniela Clark grew up sailing Optis, Blue Jays and Lasers at Pequot Yacht Club from 1990 to ‘96. She instructed at Longshore Sailing School for nine summers, from 1997-2005 and in Italy in 2001, and worked on the sailing staff at the Bitter End Yacht Club in 2002-‘03. In 2005, she and her husband Allen started PhotoBoat.com. Their photography is prominently featured in WindCheck. Daniela lived aboard her Gulfstar 37 in 2006 and ‘07, and has sailed to Key West and back and around New England. She is the Editor of WaterViews,”a blog for boaters, beach people, and shoreline dwellers” (blog.ctnews/kantor), and has been published in Sailing World and Sea Ray Living magazines.